Following up the most successful game handheld in history is no easy task. That's exactly what Nintendo is doing starting today with the Nintendo 3DS. The future begins now. Note: This is a straight-up hardware review. The Nintendo 3DS is a portable gaming system capable of displaying more realistic graphics than any of the DS consoles that preceded it. The 3DS is backwards compatible and can play DS game cartridges in addition to newer 3DS ones. The consoles itself is about the same size as the DS Lite. It's heavier than the DS Lite and the DSi, but not heavier than the original DS. 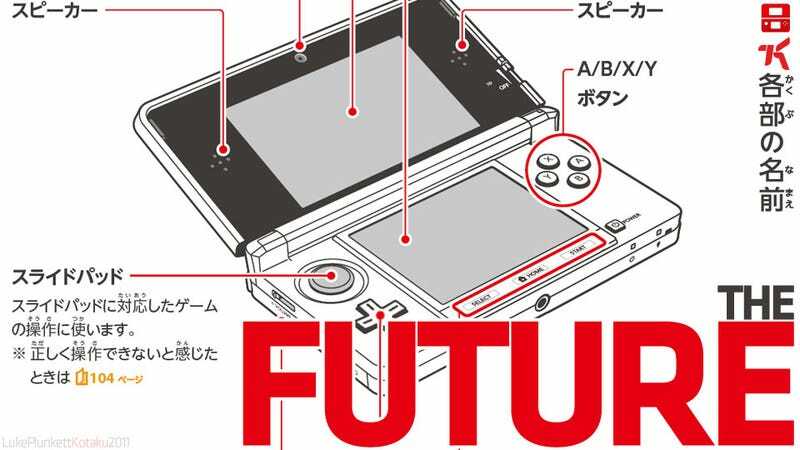 The 3DS's top screen, where the 3D effects are displayed, is bigger than the DSi's, but not bigger than the DSi XL's. However, the bottom touch screen is larger than either of the DS Lite's two screens. Like the DSi, it has a front-facing 2D camera, but it also has a pair of 3D cameras on the top lid. Other new additions include an accelerometer, a gyroscope and a circle-shaped "slide pad" above the directional pad. The stylus is retractable, a new feature when compared to the touch pens of the DS line-up. If you've played a Nintendo DS or, better yet, a DSi, you should be on familiar footing. There are two screens, with the bottom being a single-touch touch screen. The top screen shows the stereoscopic 3D effects, but the 3DS is able to play both 3D and 2D games. There is a slider that can amplify or completely shut off the handheld's 3D effects. While the DS Lite and the DSi had the Start and Select buttons on the side opposite the directional pad, they've been relocated for the 3DS. Below the touch screen, there is a rectangular panel with "Select", "Home" and "Start". Start and Select are self explanatory — as Home should be. Pressing "Home" (and you need to press) takes players back to the menu screen where they can choose from different pre-loaded applications and, in the future, downloaded software as well as play whatever game they have in the cartridge slot. While Nintendo launched a truly ugly piece of hardware with the original Nintendo DS, the game maker gets things mostly right with the 3DS. There are some truly surprising and lovely touches here with its layer cake design. The top lid is covered with a protruding translucent plastic that is supposedly fingerprint resistant. For the Aqua Blue 3DS, it gives the handheld a candy-type feeling that is reminiscent of the "Bondi blue" Macs from the late 1990s. The 3DS's middle layer is a different color and edges in ever so slightly. The bottom layer, once again a different color, juts out but not as far as the top layer. The layer cake look is not only striking, but does make it easier to open the 3DS. What's more, the different layers help separate various input switches and slots, both tangibly and psychologically. It all works very well. Interface-wise, the buttons also have a nice clicky feel that is most welcomed after the gummy mush the DS and the DS Lite offered, while the DSi was somewhere in the middle. They feel responsive and sharp, as does the directional pad. Contrasted with the smaller touch screen, the wide-screen on top makes the buttons seem smaller than they actually are. I measured them, and they do appear to be the same size buttons for what that's worth. There are two shoulder buttons that protrude further than the DSi's shoulder buttons. They are a good place to rest one's fingers and just beg to be pressed. The machine is capable of powerful graphics. It's not where Sony's new portable game machine, the NGP, will be, but it's more than sufficient and seems to have enough poke to offer visually striking experiences. The 3D slider does what it is required, allowing players to "blast" the 3D effects or turn them down to a quiet murmur. And the inclusion of two cameras on the front, while their pixel count might be low, does make for an interesting device. There's an abundance of colored LED-powered lights throughout the 3DS. So far, I've counted seven lights. Seven! They blink or remain static and generally work well in a dark room. There's a constantly blinking amber light for the WiFi, there's a static orange light while charging, there's a snoozing blue light for sleep mode, there's a green light for 3D, there's a purple light for when the camera's in operation, and so on and so forth. All these lights are not necessary, and I'm racking my brain trying to think of other portables that are this cuckoo for flickering lights. The DS Lite and the DSi both had colored lights, but the 3DS is a bit on the extreme side. And I just love it. Another welcome touch? While major electronics makers are making it damn near impossible for electronics owners to remove the batteries from their devices, Nintendo isn't. It's possible to open up the bottom of the 3DS with a screwdriver and remove the battery. Nintendo's instruction manual even provides a walk through on how to do it. Thank you! If you are paying the same amount Nintendo used to charge for its home console, you want a sturdy handheld. And the 3DS's upper lid doesn't quite seem to cut the mustard. Don't get me wrong, it's sturdy in that sense that kids can (and will) chuck it in the bags and knock it about. However, sturdy clam-shell design has long plagued Nintendo. Remember the DS Lite and the broken hinges? And how they'd eventually flop open and shut like wet noodles? The 3DS doesn't seem that bad, but there's already some give and some flop when it's opened. That worries me. Another fussy bit is that the 3DS has is the Home input panel directly below the touch screen. There are instances when players must select choices from the touch screen, but then might need to press either Select, Home or Start from the input panel just below it. But you cannot use the stylus to press buttons on that input panel, and since it's so close to the touch screen, it all becomes mushed together. The initial instinct is to use the touch pen because of its location, but you can't. Its location is entirely counter intuitive. Another location issue is the position of the directional pad and buttons, which doesn't quite match up with the directional pad below the slide pad above it. Of course, players can simply use the slide pad because it lines up with the buttons. Does this mean its the default choice? It works well enough, but portable Nintendo games have traditionally been d-pad games, and playing it on a lower plane than the X,Y,A,B buttons makes everything feel cockeyed. The touch pen is also a concern. Its location is in the back on the left side — annoying for a righty like me. It also fits firmly into place, which will prevent lost pens. That's, no doubt, a good thing. However, it makes getting the stylus out a hassle, compounded by its reach-around location. The touch pen for the original DS was located in the back, too. But that was a bad location — it reeks of a PDA from the early 2000s. Future upgrades moved the touch pen to the side, and the current location is regressive. The fact that it's retractable isn't a plus. In its retracted state, it's too small to be comfortable — it feels like a pencil nub. So it's necessary to extend the touch pen to its full length, which is another hassle. It's as if Nintendo said, "Let's figure out how to make this as complicated as possible." And then did just that. The Nintendo 3DS is a grown-up piece of hardware. And it does the grown-up stuff well. It is stylish and has an array of truly nice touches. There are quibbles, which might fade over time during the 3DS's life span. That, or be addressed in the inevitable hardware revision. Whichever comes first. The Nintendo 3DS was manufactured by Nintendo, released on February 26 in Japan, March 27 in North America. Retails for ¥25,000 or $249.99 USD. A Japanese unit was purchased by Kotaku for reviewing purposes. Nintendo of America provided two hardware review units for further consideration.